ACI is collaborating with several agencies, including with ADAPT of Philadelphia, Liberty Resources in Philadelphia and Not Dead Yet, for demonstrations against Princeton University. 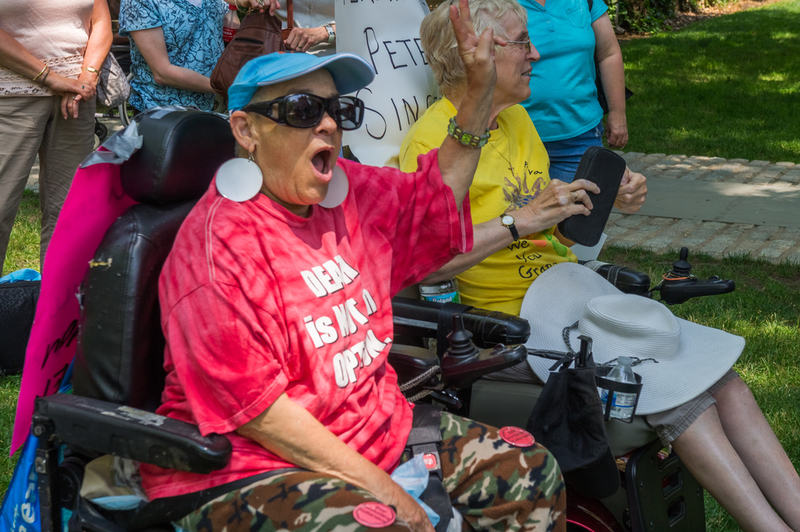 We want Princeton University to publicly denounce recent statements by Professor Peter Singer promoting ending the lives of disabled infants through denial of health care and to take other steps to address what the activists describe as Singer's "hate speech" toward disabled people. And recently a graduate student with a disability waged a hunger strike to protest the University's denial of her request for reasonable accommodations. To find out when the next demonstration will be taking place, please visit our upcoming events page. "Since about 1980, Singer has promoted public policy that would legalize the killing of disabled infants in the first month of life," said Stephen Drake, Not Dead Yet's research analyst and expert on Singer. "More recently, he has expanded his position in the context of health care rationing." In 2009, the New York Times Magazine published an article by Singer titled Why We Must Ration Health Care. In the article, Singer spoke hypothetically of assigning a life with quadriplegia as roughly half that of a life without any disability at all. On this basis, Singer laid out a case for denying health care to people with significant disabilities on the basis that these lives have less value than the lives of nondisabled people. 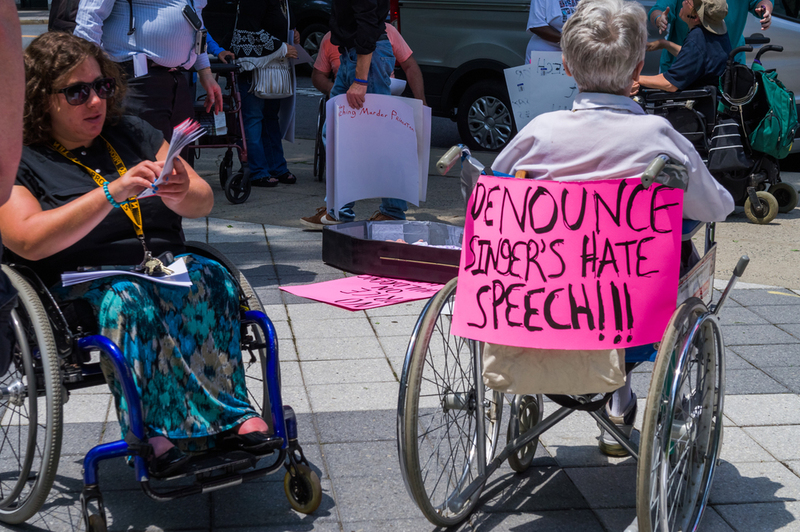 A response signed by 20 disability rights organizations was submitted to the magazine, criticizing the decision to seek out Singer as an analyst of healthcare and for the specific content of the article. "This was probably Peter Singer's most direct assault on the value of the lives of people with physical disabilities past the age of infancy," said Drake. He then used the presumed practice to rationalize the killing of disabled infants by arguing in support of "non-voluntary euthanasia" for human beings who Singer contends are not capable of understanding the choice between life and death, including "severely disabled infants, and people who through accident, illness, or old age have permanently lost the capacity to understand the issue involved." Princeton call for Singer's resignation and publicly denounces his comments. Princeton hires a bioethicist from the disability community in a comparable position to provide a platform for views that contrast with his. Princeton creates its own disability policy program to educate future leaders on an inclusive community.